What can I say about "The World According to Garp" other than, 'in the world according to Garp, we are all terminal cases.' It's the most haunting last line in all of literature, and after reading the book by John Irving, I felt so touched I decided to start this blog. I just needed to get some emotion out, and this is where I turned. That was November 2004 - it's been a long time. I started the blog to remember my thoughts on books that I read, because I had a hard time learning that things I read eventually left my head. Ironically, if you asked me what the plot of the book was about before I watched the movie, I would only give you snippets. I remember Ellen James and I remember a horrible scene in a driveway. And I remember the last line. Haunting. It was so powerful, and it lead me to read more John Irving... some, like 'A Prayer for Owen Meany' I fell in love with, while others, such as 'The Fourth Hand' fell short. 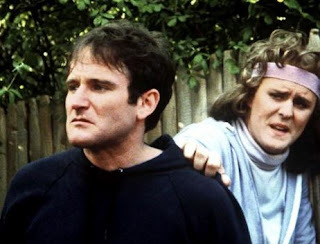 Movie: "The World According to Garp"
When this movie began, I felt it was not penetrating me. The time flew by as I watched it, but I did not really feel it at all. I'm not sure if I felt this when reading the novel, but I do remember that the book was like the movie... a lot was packed into the end. After the 1 hour and 30 minute mark, I was hooked, and the last 45 minutes were haunting and emotional. I must state that the movie did the book justice, and I was really afraid that it would not. The memories of the book came flooding back, and I remember some of the passion I had for the novel I read more than six years ago. That said, the movie will never be what the book was to me... though, it was a good experience and I'm glad I watched it. I expected a good performance by Robin Williams, though I was expecting him to be 'sillier' - probably a reason I wasn't that excited about giving the movie a try. He was much truer to character than I thought he would be, and I was glad for that. Another thing that surprised me was seeing John Lithgow as the transgender woman. Honestly, I think he stole the performance from Robin Williams. I didn't look it up, but I hope he won something for it. I liked John Lithgow from the moment I saw him as a child in 'Harry and the Hendersons', but he won me over with his performance in '3rd Rock from the Sun', one of very few programs that I have ever been attached to - 99% due to his performances. Anyway, I am rambling on here and I am probably doing a disservice to the movie with this shoddy review, but I am not a fan of giving away the plot and I think you should always read the literature first. My primary intention in this post is to let you know if the movie does the book justice, and I'm happy to report that in this case, it does.